Nothing kicks off a Party quite like a big ‘ole Thunderstorm! This past Tuesday, June 23rd, we hosted our first ever Engagement Party Summer Social and yes, it started off with a bang! It was almost like it was timed for the beginning of the party! Right before 6PM, it started getting dark and the clouds rolled in and then boom…thunder, lightning and a huge downpour! Many guests had already arrived and several were just getting here and decided to wait in their cars for a few minutes. Like any good photographer would do, Clark Berry remained calm and assured me that it was a fast moving storm and would clear up soon (he was indeed right). And like any well planned event, we were prepared with a tent, thanks to Lee Pitcovich with Celebrations of Columbia! They say rain on your Wedding day is good luck right? Well, it must be good luck to have rain at your Engagement Party too! We ended up having a great party that lasted until almost 9pm and we were thrilled with the turn out! We had lots of wedding professionals attend from the Columbia area as well as engaged couples and friends stop by and enjoy the festivities! Everyone enjoyed delicious food from Applause Catering, Desserts from My Dessert Bar and Izzabee’s Confectioneries and cake samples from Bonnie Brunt Cakes. Since it is summer time in SC, we also provided frozen lemonade from Famously Frozen to cool everyone off! It was a great chance for folks to visit and meet new people, see our gift shop, tour our flower barn and even check out our chickens and vegetable garden on our property! I’ve included a few other photos from the party! Delicious food provided by Applause Catering! Flowers for the bathroom of course! We added fresh flowers to Bonnie Brunt’s beautiful cake! Beautiful display of delicious treats from Izzabee’s Confectioneries! THANK YOU to Celebrations of Columbia for the awesome tent! Thank you also to Celebrations for providing cocktail tables under the tent! Can’t wait to plan next year’s Engagement Party! 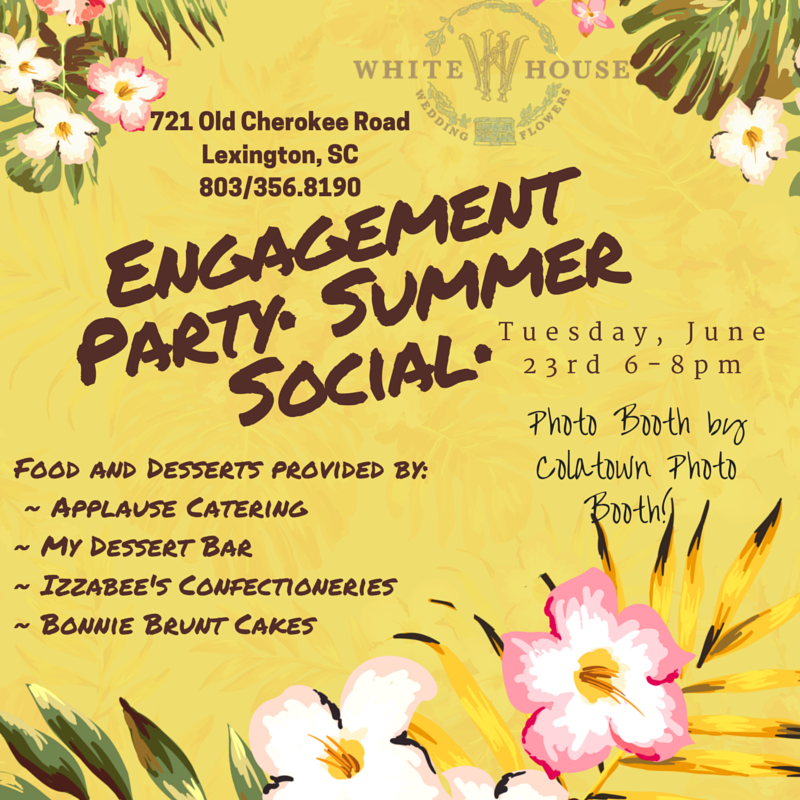 This entry was posted in Events and tagged Applause Catering, Bonnie Brunt Cakes, Celebrations of Columbia, Engagement Party, Famously Frozen, Izzabee's Confectioneries, My Dessert Bar, White House Florist, White House Wedding Flowers. Bookmark the permalink. ← The Carnation is making a comeback!